Japan's HIDEOUT makes his solo debut single on 19BOX RECORDINGS with a collaboration of Sweden’s JELLYMAZE(aka BJORN FOGELBERG). HIDEOUT is the club project of HIDE from HOT STATION. He’s well known as one half of Hot*Dog; who have had many hits in Japanese pop market before. His original is based on funk music with soul, jazz and hiphop. JELLYMAZE added a house flavour to the original. JELLYMAZE is a pseudonym of Swedish producer BJORN FOGELBERG, who used to own a label called XAKK RECORDS for his own productions. He has released tracks SYSTEM RECORDINGS , KYR RECORDS and of course his very own XAKK RECORDS. ”Hide And Seek” has the feel of laid back house music from the early 90’s. Remixes duties come courtesy of JULIO LARGENTE from Argentina. You may best know JULIO LARGENTE for his label OPENDECKS RECORDS. As a producer, he has signed to several labels such as OFFSIDE RECORDINGS, ACUTE RECORDINGS, AUGENRING RECORDS, NOIZEN, USB DIGITAL, BIT RECORDS MEXICO, ELETRODOMESTICOS, VISE VERSA MUSIC and of course OPENDECKS RECORDS. His sound claims from his early techno influences, defining a sort of eclectic style. It combines strong groovy basses, electric FX, and emotional melodic patterns. The end result is a spacey and tech-laden prog workout. Japan's HIDEOUT makes his solo debut single on 19BOX RECORDINGS with a collaboration of Sweden’s JELLYMAZE(aka BJORN FOGELBERG). HIDEOUT is the club project of HIDE from HOT STATION. He’s well known as one half of Hot*Dog; who have had many hits in Japanese pop market before. His original is based on funk music with soul, jazz and hiphop. 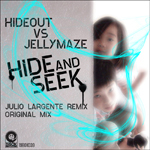 JELLYMAZE added a house flavour to the original. Remixes duties come courtesy of JULIO LARGENTE from Argentina. You may best know JULIO LARGENTE for his label OPENDECKS RECORDS. Due for release on 18th October 2010 on 19BOX RECORDINGS. We are happy to present two EPs by VALID EVIDENCE and HOT STATION through 19BOX SPECIAL. VALID EVIDENCE's "I Like Chopin" was originally done by GAZEBO, but here in Japan, Japanese cover version by ASAMI KOBAYASHI was bigger than original so VALID EVIDENCE have covered the cover version. After the great remix on DJ 19's "Blaze Of Glory“, HOT STATION will drop their 2nd single "break". This is a superb EP and HOT STATION is a very interesting project to keep an eye on, so many of the sounds here on this EP are really fresh and unique which is tough thing to find nowadays!